Last week, Graham Gano missed a field goal and an extra point – ultimately four points the Panthers would need, costing them the game when a failed two-point conversion fell incomplete in Detroit; Ron Rivera said that he went for two to try and win the game on the road, not because he didn’t trust his kicker. Faced with a do-or-die situation this week, he backed that sentiment up when he sent out Gano to kick a 52-yarder with 1:45 left in a tie game that the Panthers absolutely had to have as they battled for the NFC Wild Card – Gano had made 41 consecutive field goals at home. 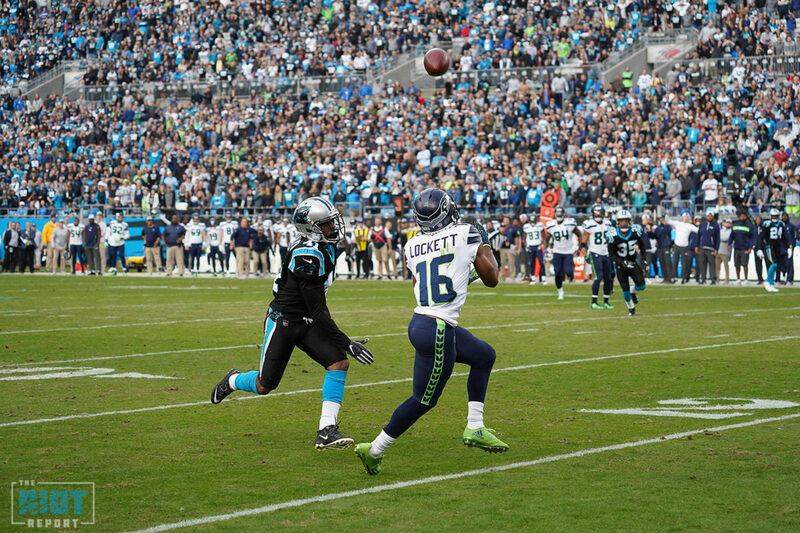 But this time, just as he did last week, he missed it – a 43-yard completion to Tyler Lockett and a 31-yard Sebastian Janikowski field goal later and the Panthers had lost 30-27, their third straight loss; the Panthers are 6-5 and looking up at Seattle – who share the same record but now own the all-important tiebreaker – in the standings. While the team lost, there were a lot of positives to take away from the game – if that field goal had gone through, we would be talking about the special day the offense had as they beat the Seahawks by the skin of their nose instead of wondering who’s job will still be intact come Monday. 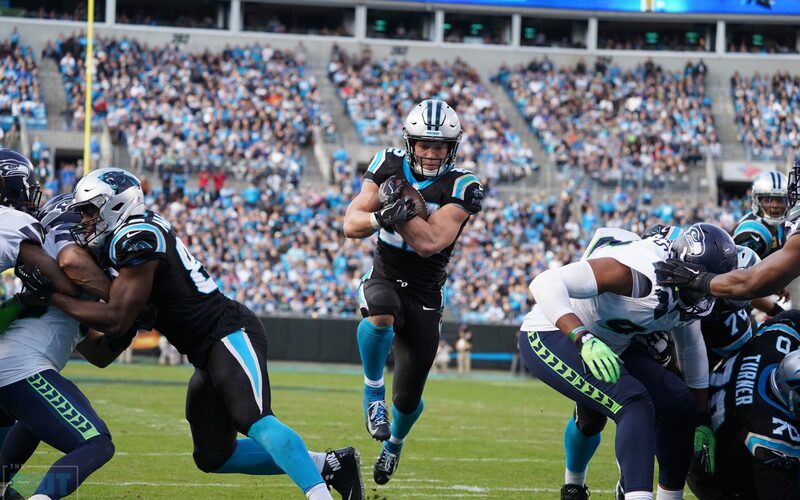 While much of the pregame focus was on the Panthers young wide receivers with Devin Funchess out with a back injury and Torrey Smith limited in practice this week in his first action since Week 7, it was the Panthers second-year running back who would make most of the noise on offense as Christian McCaffrey exploded for a franchise record 239 total yards, 125 on the ground and 114 through the air – McCaffrey had a 59-yard run up the gut in the fourth quarter to break into the red zone, then followed that with a 15-yard rush to the one-yard line, then followed that with an attempted dive over the top. When that didn’t work, two plays later, he would catch a pass in the flat to put the Panthers up a score with just under seven minutes left. While McCaffrey was putting on a show, Cam Newton was continuing his quietly excellent season, as he completed 24-of-29 passes for 255 yards and rushed for 63 more, setting the franchise record for most consecutive completed passes (16) along the way. Newton has been excellent in the red zone this season – through 10 weeks, he had the leagues’ top passer rating inside the 20 and had 18 total scores against zero turnovers. The Panthers had also converted both of their fourth-and-short opportunities this season, so when the Panthers first possession went inside the Seahawks five-yard line and the team was presented with a fourth-and-2, it was easy to trust Ron Rivera’s decision. And when Newton couldn’t convert – even after Rivera challenged the play to force the referees to take a second look at the spot – it was a harbinger of the Panthers’ red zone troubles to come.  The Panthers, who entered the game having scored a touchdown on over 70% of their red zone trips, came away with nothing twice and had only 13 points to show for four first-half trips inside the 20 – their only touchdown came on an RPO to Curtis Samuel in which he put cornerback Shaquill Griffin in a blender and was wide open for the score. Samuel, who had by far his biggest workload of the season, would finish with two catches for 17 yards and a single reverse for 25 – after missing the first four weeks of the season with a heart ailment, Samuel has scored touchdowns on an inordinately high number of touches. That trend continued as Samuel scored on one of his three scores. The Panthers would score only three times on seven red zone visits as their season-high 476 total yards were wasted on only 27 points – they came away with only three points on their first two attempts as they ran the ball eight straight times in the red zone to start the game; their first pass in the red zone was the touchdown to Samuel that put them up 10-3 in the second quarter. The Seahawks would quickly strike back with a 75-yard drive that ended with a one-yard plunge by Chris Carson to tie it at 10 – a two-minute drill highlighted by a 38-yard catch-and-run by McCaffrey would put the Panthers in the red zone again, but they would only leave with three points to send them to a 13-10 halftime lead. The Panthers have struggled in the third quarter all season – coming into Sunday’s matchup with the Seahawks, they’d only scored 13 points over the first 10 third quarters of the 2018 season. But when they opened the second half with five plays for 50 yards including a 26-yard scramble from Cam Newton on third-and-long, it appeared they were going to reverse that trend – for a moment. Newton threw an ill-timed interception in the end zone as he targeted a double-covered and little-used tight end Chris Manhertz – only his third target of the season – on a pass up the seam that was intercepted by Bradley McDouglald. The Seahawks would take advantage of that turnover by promptly driving 80 yards in only seven plays for an touchdown; the drive included a 54-yard completion to David Moore on third-and-long and finished with an 11-yard throw to Tyler Lockett to give the Seahawks a 17-13 lead – that also came on third down. The Seahawks entered the game with the top rushing offense in the league, but it was their passing game that would give the Panthers fits – Russell Wilson would finish 22-of-31 for 339 yards, but he was 15/18 for 218 yards and two scores in the second half as the Seahawks erased a three-point halftime deficit to tie the game consistently throughout the second half – it was an absolute dime on fourth-and-3 to David Moore over second-year corner Corn Elder that tied the game at 27 before the Panthers’ final drive; once Gano missed the field goal, it was up to Wilson to engineer his 22nd game-winning drive of his career. Turns out, it was another third down that would ultimately do in the Panthers. On third-and-5 from their own 47, the pocket collapsed and Wilson, as he’s done hundreds of times in his career, bought some extra time by moving to his left, set his feet – and made a play, this one a 43-yard lob to Tyler Lockett that put them in field goal position as Captain Munnerlyn struggled to catch up with Lockett as he streaked down the field in a scramble drill. 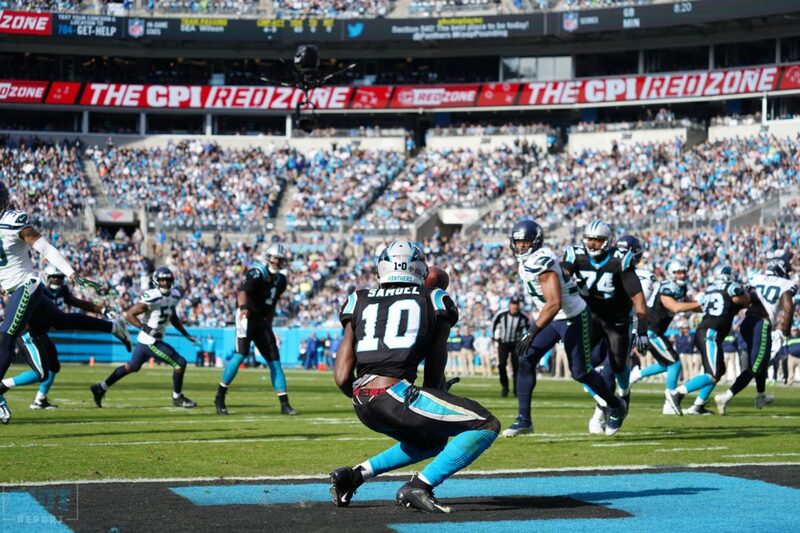 The play that broke the Panthers’ back. Devin Funchess was inactive with a back injury – it was only the second missed game of the wide receiver’s career. Funchess was active during warmups and on the sidelines during the game as he interacted with the other wide receivers. James Bradberry had his first sack of the season and only the second of his career on the first drive as he ended the Seahawks first drive with a sack of Russell Wilson. The Panthers had won 10 straight home games before losing. Over the last two weeks, DJ Moore has totaled 248 receiving yards, the most receiving yards by a rookie wide receiver over a two-game stretch in franchise history. 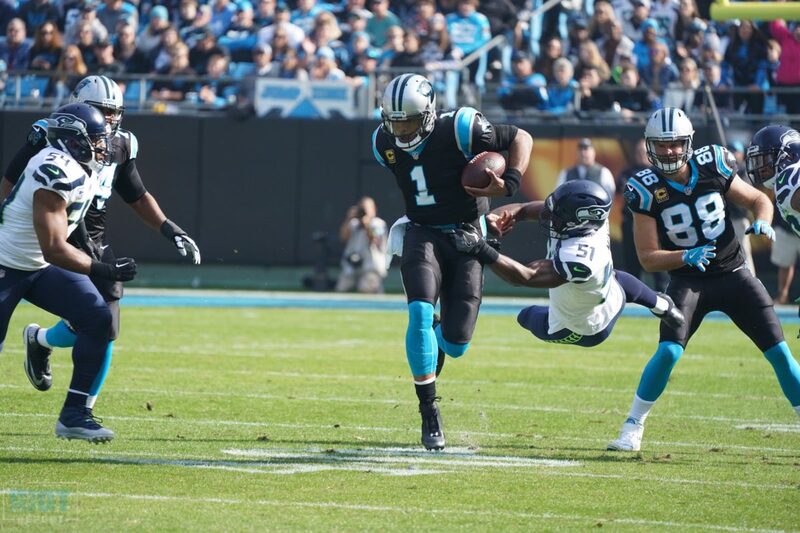 The Panthers totaled 476 yards of net offense, which was the highest total of the season; this was the first time the Seahawks had rushed for under 100 yards in the past nine games – Seattle came into the game with the #1 rushing offense in the league. Donte Jackson injured his quad on the first defensive snap of the game and did not return; the Panthers only had three cornerbacks active today and all were pressed into duty – Captain Munnerlyn was the cornerback opposite James Bradberry and when the team needed a nickelback, Munnerlyn slid inside and Corn Elder played the outside.